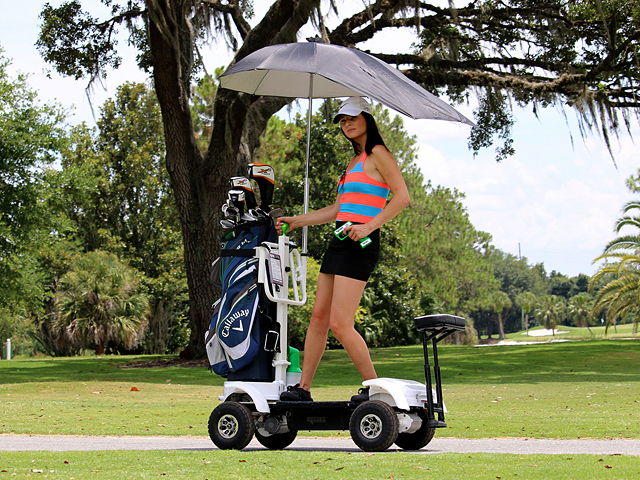 The Golf Skate Caddy is a practical single rider golf cart that makes sense even for the less nimble and doesn’t require an outrageous set of skills to use—all you have to do is stand on it. And, because it has four wheels there’s no surfer-like balancing act to stay on. Maximum speed is 13mph and its stable as long as it’s ridden sensibly with steep slopes negotiated properly. The battery powered Golf Skate Caddy is appealing for a couple of very practical reasons. It speeds up play and being relatively light—only about 85 pounds plus bag and rider–doesn’t tend to overly compact turf. In front is a platform and strap arrangement to hold the golf bag, in the back there’s a cooler and a seat that slides into place for use when waiting for the group in front of you to hit. Operation is straightforward simply step on, grab the steering handle in one hand and the pistol-style remote control in the other and you’re on your way. There’s even a custom-designed umbrella that may be mounted in a bracket on the handle for shelter from sun and rain and each GSC may be GPS-tracked by golf club personnel. 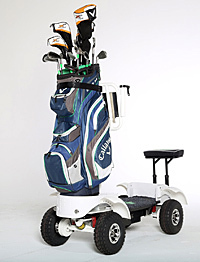 Pires responded when asked about pricing, “Our retail price is $4995, which includes all the bells and whistles!” This places the Golf Skate Caddy below the price of most conventional two rider electric carts. I found the operational learning curve is only a few minutes, in fact it’s fun to buzz around on and everyone who tries it seems to have a smile on their face. Though the company does sell to individuals their primary market is either sale or leasing to golf facilities which then rent them on a per round basis to golfers at a suggested minimum rental fee of $20.